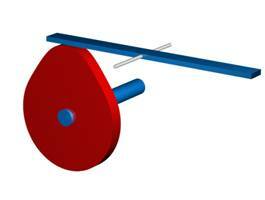 A lever is a great device for using a small force to lift or move a larger weight. It rotates in an arc around the fulcrum, which is the point at which the lever pivots. A hole puncher and pair of scissors are both types of levers. Levers are used in many mechanisms to translate the rotary motion of a cam into an up down or linear motion, or to amplify a small distance into a greater distance. 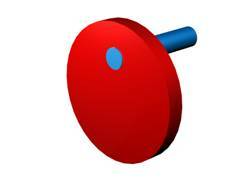 Cams change a rotary motion into a linear motion that follows the shape of the cam. Cams can have a variety of shapes, or profiles, which determine which way the follower will move. One example is the pear-shaped cam which can be seen below. Imagine this pear-shaped cam lifting up or pushing down on a lever. It has a profile that will keep the rocker arm, or follower, motionless for about half the cycle and then the wheel makes it rise and fall. Paula Gaetano Adi has used cams to create her sculpture the Desiring Machine in which milk moves along tubes and are collected in her waterproof dress. 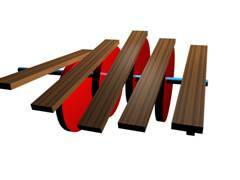 Circular (eccentric) cams with followers can be used to create a series of slow motions that allow slats to rise and fall in sequence. 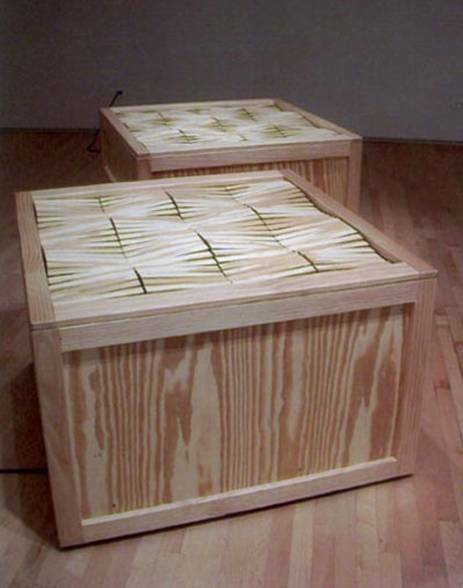 Jeff Carter has created a series of works that create complex wave-like patterns as DC gearhead motors spin, causing the plywood slats to rise and fall in synchronicity as if they were waves on the ocean. A Vague Sensation of Paradise by Jeff Carter. 2002. 43 x 41 x 26. 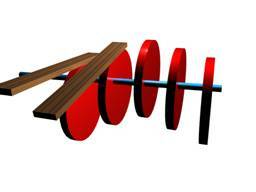 A series of circular eccentric cams and plywood followers made this piece function and appear to create the motion of ocean waves. The work is peaceful and very well crafted, and the use of the plywood for the wave material and the shipping crate alludes to ocean, travel, and distance, and creates a unified aesthetic of meaning and material. This piece has a rare materials sensibility found in the best artwork of this category.